A new large scale indoor show building on the success of the Exhibitionists for Road Show 2012. The Exhibitionists project was created for Exhibition Road Show 2012. 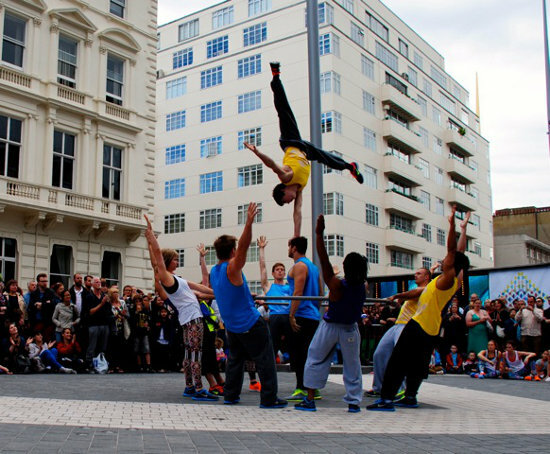 24 recently graduated acrobats / circus performers and dancers worked under the artistic direction of Sue Broadway (Ra Ra Zoo, Circus Oz, etcetera), supported by Lindsey Butcher, Ella Robson Guilfoyle and Tony Adigun, to create original site-specific work for Road Show. The Exhibitionists were funded by Arts Council England and the Royal Borough of Kensington and Chelsea. The success of this project generated interest from venues and performers to develop the concept. In 2014, DREAM, who produced the Exhibitionists, are developing a new full-length show for mid- to large-scale venues based on the same ethos of providing new work opportunities for recently graduated performers. This new show will engage established directors, designers and choreographers to work with a new team of 14 performers selected from open auditions and focused on providing unique early career opportunities for emerging creatives.